HANGMAN, by Martin McDonagh, has transferred from the Royal Court Theatre for a limited season at the Wyndham's Theatre in London's West End. It has been Directed by Matthew Dunster. It has been some time since we have seen a new play from Mr McDonagh. His last play was A BEHANDING IN SPOKANE, seen on Broadway in 2010. He seemed to have 'sworn off' the theatre form and decided to create film instead, which he did with, IN BRUGES (2008) and SEVEN PSYCHOPATHS (2012). I liked them both. 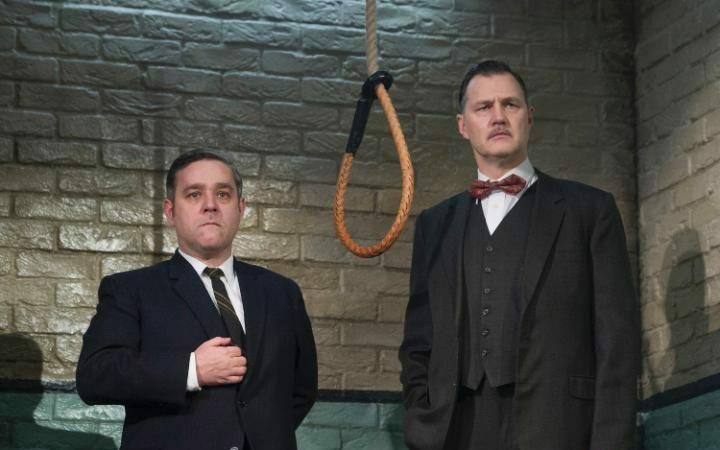 HANGMEN begins at an execution by hanging in a prison in Britain in 1963, just prior to its abolition in 1965. It is being led by Harry (David Morrissey), the second best hangman of the time, under the shadow rivalry with Pierpont - the number one (John Hodgkinson). Harry implacably carries out his duty inspite and despite the prisoner, Hennessy (Josef Davies) claiming, with growing pathetic hysteria, his innocence. The writing is both graphically horrifying and blackly hilarious and is shockingly ended with the jolting of the weighted body of Hennessy plunging through the trapdoor with a twang and a thud. The whole of the cream and green walled realistic prison setting of the first scene rises into the flies of the theatre to reveal another set of stark realism, a grim updated Victorian wood panelled bar in a pub in Oldham in the North of England (Design by Anna Fleischsle), owned and run by the now retired Harry, his wife Alice (Sally Rogers), with their frumpy teenage daughter, Shirley (Bronwyn James). In the smoky fug of this space we meet a group of men, alcoholic and moribund to varying degrees of decay as specimens of the human. All indulge in an awe of their host, and are sycophantic in their humour, lugubriously, watching intruders such as a local newspaper journalist searching for a story from Harry concerning his past career. The text is steeped in the petty ignorances and prejudices of the period - signalled with unconsciously racist, sexist, and homophobic remarks. The contemporary audience found them all familiarly amusing. How times have changed, eh? 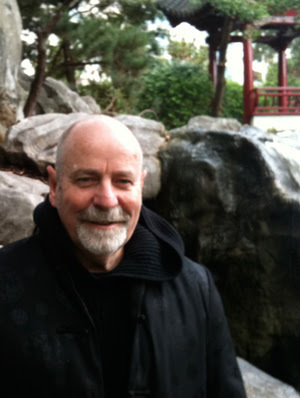 The plot u-turns and twists, grow with the usual McDonagh skill with the old fashioned play-construction of the melodramatic – which has been part of the lunatic pleasure we have had with his past works, softening, perhaps, their violence and politics: THE BEAUTY QUEEN OF LEENANE (1996), THE LIEUTENANT OF INISHMORE (2001), THE PILLOWMAN (2003) - when into the mix of these self-contented cronies, a visitor, a mysterious stranger from the south arrives, and while ostentatiously flirting with Alice and Shirley, laconically reading the newspaper, smoking and drinking, he casually provokes Harry into a growing sense of alarm about his secure provincial status quo. This is Mooney (Johnny Flynn giving a very good performance), a hip, hair tousled blonde, whose reasons to be there insidiously grows to a mounting suspicion and terror, culminating in the discovery of Shirley's disappearance and the untimely absence of the Visitor. There is in the character drawing of these men, with the mundanity of their verbal exchanges, vestiges of the working class tensions and comedy of some of Harold Pinter's crims. And it is in the frightened and panicked gestures of these men towards Mooney, as the climax of the play unfurls, that the humour of an Ortonesque kind escalates into the black farce of the slowly strangling victim squirming behind a curtain as Pierpont, the number one Hangmen, arrives, and in a brilliantly funny and long harangue, verbally admonishes Harry about his delusions of his past standing in his now extinct profession, stirred by the article that the newspaper man had secured. In the world today, almost 40 nations are still using the death penalty. In most countries, you can be executed for only two crimes: murder and treason. But in a small number of places, the state is willing to kill you for other reasons too. Being gay, for example, Or committing adultery. Or practising witchcraft. The death penalty has its supporters, of course. Fifty years after capital punishment was abolished in the UK, survey after survey shows that a majority of voters here favour its re-introduction, especially for such offences as child abuse or terrorism - despite the fact that we've seen repeated evidence of people wrongfully convicted of capital crimes, here and around the world. And indeed, at the heart of positive attitudes to the death penalty lies a fundamental incoherence: killing someone, we're told, is so severe a crime against our society that the only way to avenge it is ... by killing someone. This is Mr McDonagh's first play set in England. And, perhaps like the motivation that Mr McDonagh claims caused him to write the bloody THE LIEUTENANT OF INISHMORE, HANGMEN comes from his continued sense of 'pacifist rage' that believes that violence is abhorrent. Whatever the motivation, I felt that despite the usual immaculate storytelling skill of plot and character and the outrageous humour of this writer, the work lacked the famed powerful and subversive sting of his usual political critique and was, essentially, a 'minor' work. That impression may have been, also, because I felt the company of actors had arrived, in performance, at too formulaic a pattern of playing the play, and were, consequently, underwhelming in the stakes of it all. A bit of 'a walk through' for me, a little too comfortably theatrically stretched in their offers to be a completely satisfactory evening: Playing to a familiar pattern of performance with the audience, instead of a living re-newed exploration of the possibilities of the storytelling as it happens. As I walked down Charring Cross Road to the Wyndham's Theatre, to see HANGMEN, I glanced to my left, and I saw the lighted signage for Agatha Christie's THE MOUSETRAP, at the St Martin's Theatre, which has played continuously in London since 1952. 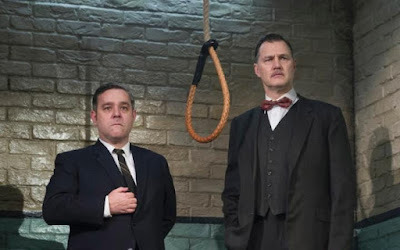 After the performance of HANGMEN, I couldn't help but ruminate that Mr McDonagh's play was a 2015 version of Christie's very successful genre. Mooney, too, had the classic echo of Emlyn William's invention of Danny in his 1935 play, NIGHT MUST FALLS. Emlyn Williams, Agatha Christie, Joe Orton, Harold Pinter and now Martin McDonagh. A roll of honour, in the field of entertainment, indeed!